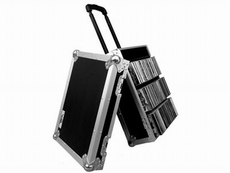 Raw-edged style and protection, the RRCD100HW, can handle it all.This rugged, ATA style case is built to hold up to 100 CD's in jewel packs and features our smart storage compartment to store all your messy accessories. And because we know that lugging around your gear can be a hassle we designed the RRCD100HW with our unique low-profile wheels for sleek, stealth mobility and included a rugged pull-out handle so you can pull or push your gear with ease. Rugged features such as beefy, stackable ball corners, and a spring loaded handle seal the deal. The perfect storage! solution!